What does CRM mean for your organization? There are so many articles floating around these days expressing the importance investing in a CRM (customer relationship management) tool. I wholeheartedly agree with that statement, however, I want to explore what CRM really means for a business. As you can see from these compelling stats, CRM usage and adoption is on the rise. However, implementation continues to be an issue for many businesses. A lot of this falls on training, but in my opinion, organizations do not fully understand nor embrace how CRM is going to transform their overall business. Whether you had a process to begin with or not, a CRM really makes it official. Why? CRM brings transparency to an organization. If it isn’t in the CRM, it didn't happen. All data and activity for both team members and leads/clients are tracked within the platform, keeping everyone accountable. CRM workflows, such as follow up workflows when a person fills out a form, take both the lead and the sales/marketing rep through specific steps and tasks. This series of activities makes up part of your business process. This strategic process makes up a large part of your customer experience, creating a consistent journey for your leads and clients. Process, no matter what, is a critical growth component. Without process, there is no set standard for how you do business, resulting in highly inconsistent inconsistencies, inaccurate data, and the inability to provide optimal customer experiences. Transparency within an organization creates a more collaborative and productive workforce. Because all activities are housed within a single platform, your team members are able to see what was done, who worked on the task, and which tasks are to be completed. This transparency not only keeps your team accountable to each other, but enables each department access to the information they need to help them do their jobs better. A sales person is making a follow up call to a new client. With an integrated CRM, they have access to whether that client issued a support ticket, called the support line, opened up any emails you sent, and more. This data helps the sales person better meet the needs of the client. You are well-informed and equipped with the knowledge to really help solve your client’s pain points. A client calls in to your support team with an issue. The support team member is able to look up the contact record, see past conversations, tickets, emails, chats, and more. This way they can reference any past interactions that might be relevant to their current issue. Sales, in turn, can see how the issue was resolved and follow up appropriately. Both of these are great examples of how CRM creates transparency within an organization. Use triggered workflows to systemize the process, whether it is a support follow up or a sales follow up. This statement relates back to transparency as well. Data and transparency with that data allows companies to do business better. They are more informed and therefore able to take action based on real time analytics and information. A CRM platform that works in real time, will yield information that both sales, operations, and marketing can use to trigger highly specific workflows to help drive leads down the funnel and optimize the customer journey. It also helps with customer retention and loyalty. Segmenting your contacts is the first step to personalizing your marketing. You have to obtain enough accurate data about your leads and customers to be able to segment and target. Use custom user-defined fields to store custom (and important) demographic data about your contacts. Use this data to personalize your messages, so each email, download, etc that goes out to them is relevant to their needs. Marketing automation is a great way to accomplish segmentation and personalization for all of your campaigns. As you generate leads and obtain both demographic and behavioral data, trigger messages based on this data. Results prove that these automated and personalized emails get far higher engagement, generating a significant influx in revenue. 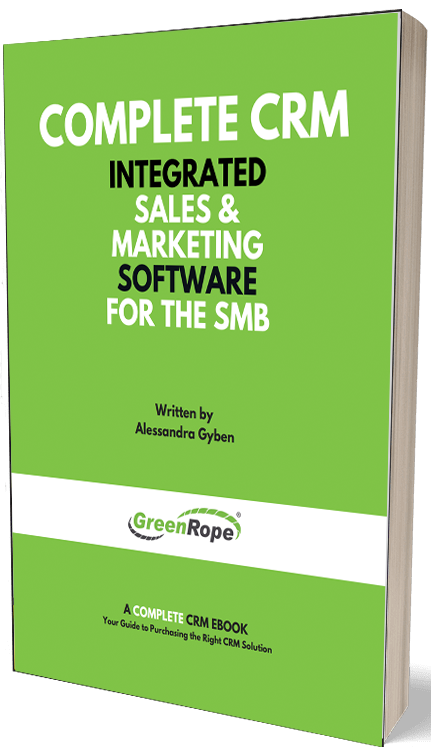 Your marketing team just released a great new ebook, and would like to make sure new leads receive this content in a new lead nurturing campaign. However, they want to target all leads with interest in the topic of the ebook. They use CRM data to filter the contacts who should receive the email. Sales can then use this ebook and whether the lead opened the email or not as an intro to a conversation and perhaps another lead nurturing tool. What does the mean for your business? With CRM and marketing automation, you transform your business into a data-driven model with the ability to personalize communication with your contacts to increase engagement and ultimately sales. With the state of pretty much everything moving at the speed of light, it is critical to stay agile in your industry and in the marketplace. Consumers want to see brands that are keeping up with the trends and consistently improving the customer experience. This means, improving process, improving data and how you use it, and improving the relationships you have with your clients. We all want to be efficient. A CRM with built in marketing automation keeps your business nimble and able to adapt to particular trends in the market. As more data becomes available or as it changes and evolves, your CRM and marketing automation platform utilizes these changes to deliver more timely, relevant messages. Instead of relying on a manual process of exporting and importing new data all of the time, your CRM does this for you, making you more efficient and your messaging more on point. You also avoid the risk of losing data or wildly inaccurate data because the data collected is directly correlated to the behavior or your contacts. More data means that you can quickly change up your process. With real time analytics and reporting, any business can easily see what is working and what’s not. Have your buyer profiles evolved? Do you need to be sending more emails? Fewer emails? Are people responding to your lead nurturing strategy? With technology, you identify wins and losses and can quickly evolve your strategy. This is agility in the marketplace. Along with making a business more agile and efficient, cloud-based platforms are constantly making upgrades and adding in new features for their users. This means that you do not have to rely on your vendor or IT department to upgrade the system, instead these changes are done automatically and readily available to your team without further effort from the organization. Cloud-based CRM and marketing automation platforms are disrupting the industry and allowing smaller businesses to compete on a higher level than in the past. Now any sized business has access to the same technology, technology that transforms. As a marketer, I have seen how many businesses have been transformed with the successful implementation of sales and marketing technology. However hesitant you are to transformation, it is what will keep you competitive. As consumers continue to expect more from the companies they do business with, it is our job to find ways to engage and connect on a deeper level. If you are looking to implement a CRM, please read, Successful CRM Implementation.